The New York Times will cut in half the number of articles readers can access for free , allowing nonsubscribers to read five free stories each month, starting today. According to Bloomberg, which first reported the news, this is the first change to the NYT’s metered paywall since 2012. It is an effort to get more readers to subscribe. A digital subscription to The New York Times is $16 a month. The newspaper added 154,000 digital-only subscriptions last quarter, a 14% increase in new customers from a year earlier. Meredith Kopit Levien, The New York Times Company’s executive vice president and COO, told Bloomberg this was the right time to tighten its paywall, since demand for journalism is “at an all-time high." The publication is breaking daily stories on the chaos in the Trump administration, Robert Mueller's Russian investigation and sexual-harassment accusations against powerful men. However, reducing the number of articles readers can see for free could result in a drop in traffic and digital ad revenue, which increased 11% last quarter from a year ago. 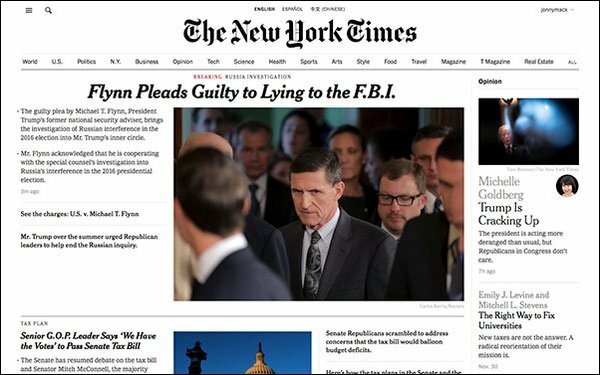 The gains earned from increasing the number of new subscribers — from building loyal readership to a consistent source of revenue — appear to outweigh those risks for the NYT. (Print ad sales, on the other hand, fell 20% last quarter). The NYT isn't the only publication to limit free content. In May, The Boston Globe reduced its number of free articles from five to two every 45 days. This week, Wired said it will introduce a metered paywall next year.